I’ve always been impressed by the way Bolivians adapt creatively to new situations. The other day Ana and I went to a farmers’ fair in the small town of Colcapirhua, near Cochabamba. The fair was due to be held in the charming main square of the town. Paved in flagstones, closed to through traffic and with steps leading up to a small church it would have been a delightful venue. But local townspeople were already there, angrily but peacefully protesting about alleged corruption in their town council. The protesters were there to stay, so the farmers moved their fair two blocks south, where they strung out their stands on an empty side lane along the main highway between Cochabamba and La Paz. It was less picturesque, but there were more potential customers passing by. The farmers selling goods represented organized groups from all regions of Bolivia. 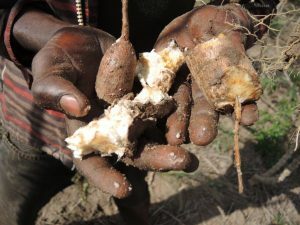 The fair was actually part of the annual meeting of the National Soils Platform, which had chosen “fair trade” as its annual theme. As we moved up the line of stalls, the farmers were keen to sell us a wide range of goods that were not only high quality, but also unique, such as strawberries from the valleys of Santa Cruz, oven dried to sweet perfection. Coffee growers from the Amazon (parts of which are cool enough for coffee) had brought little plastic bags of coffee seed. “Ready to plant!” they exclaimed, eager to encourage other farmers to start growing their own coffee. Cacao farmers from the Beni had bitter, white and milk chocolate. 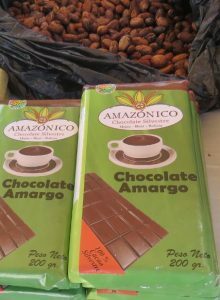 There was real pleasure in buying chocolate from the people who had made it from the cacao beans that they grew themselves. There were tiny puffed grains of amaranth (ready to eat like cold cereal), fresh cherimoyas (a native fruit—but of a small, sweet variety that is now hard to find). Some farmers from Chuquisaca had a local variety of chilli that was so hot, it is called “la gran putita (the great little whore)”. We had to buy some. There was traditional food, like an aged cow’s cheese from the warm valley of Comarapa. It tasted marvelous, but the smell of cow was not for beginners. What struck me the most was how many of the products were new, and inventive. Things you wouldn’t find in the supermarket in Cochabamba, such as dried apples, preserved peaches still on the stone (moist and sweet but with no sugar added). Quinoa and wheat were packed in neat plastic bags, with labels, ready to make into soup. We have said in a previous blog that smallholders with attractive products struggle to produce equally attractive labels, which by law often have to list ingredients. Here, the chocolate was wrapped in handsome paper with a printed label. My favorite was the apple vinegar, in recycled Mexican beer bottles. The farmers had covered the beer label with a new paper one, proudly explaining that this vintage was made from just three ingredients: organic apples, raw cane sugar with no additives, and water. The bottles were neatly sealed with bright yellow bottle caps. 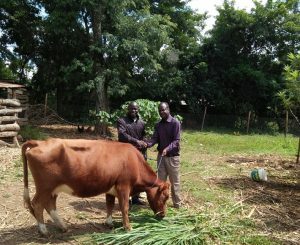 Most of these farmers’ associations have received support, often from their parish priest or from Church-sponsored NGOs, some with volunteers from Europe and elsewhere. Outside help in manufacturing and packaging had clearly contributed to the quality of the goods, but the farmers were self-motivated to sell their goods. Agriculture is in large measure about producing something to sell. Although this was an event on fair trade, there was no mention of being certified as fair trade. One speaker the first day had mentioned some of the hurdles that keep smallholders from being able to qualify for fair trade certification, and this group had readily agreed with her. This group of smallholders certainly understood one basic idea, marketing means you must have something nice to sell: attractive, high quality and well presented. Farmers across the globe deserve a fair price for their products, and smart marketing helps to achieve this. Los bolivianos siempre me han impresionado con su habilidad de adaptarse creativamente a las nuevas situaciones. El otro día fui con Ana a una feria agrícola en el pueblito de Colcapirhua, cerca de Cochabamba. La feria tenía que realizarse en la linda plaza del pueblo. Enlozada, cerrada al tráfico de autos y con una capilla sobre una colina, hubiera sido un lugar encantador. Pero algunos vecinos del pueblo ya estaban allí, protestando pacíficamente pero molestos contra la supuesta corrupción de sus concejales. La protesta no se movía, así que los agricultores trasladaron su feria dos cuadras al sur, donde colocaron sus carpas en una fila en un camino vacío al lado de la carretera principal entre Cochabamba y La Paz. El lugar no era tan pintoresco, pero sí había más compradores que pasaban a pie. Los agricultores representaban a grupos organizados de todas las regiones de Bolivia. En realidad, la feria era parte de la reunión anual de la Plataforma Nacional de Suelos, que había escogido a “comercio justo” como su tema anual. Al caminar por los puestos, los agricultores estaban con ganas de vender una amplia gama de productos que no solamente eran de buena calidad, pero también únicos, como las frutillas (fresas) de los valles de Santa Cruz, secadas a la perfección en horno. Caficultores de la Amazonía (partes de la cual son tan frescas que se puede cultivar café) habían traído bolsitas de semilla de café. “¡Listo para el almácigo!” exclamaron, felices de animar a otros a producir su propio café. Productores del Beni tenían chocolate amargo, blanco y con leche. Dio gusto comprar chocolate de la gente que lo hizo, a partir de granos de los cacao que ellos mismos cosecharon. Habían pipocas de amaranto. Habían chirimoyas (un fruto nativo—pero de una dulce variedad pequeña que cuesta encontrar). Algunos de Chuquisaca tenían una variedad local de ají tan picante que le llamaban “la gran putita”. Había que comprar un poco. 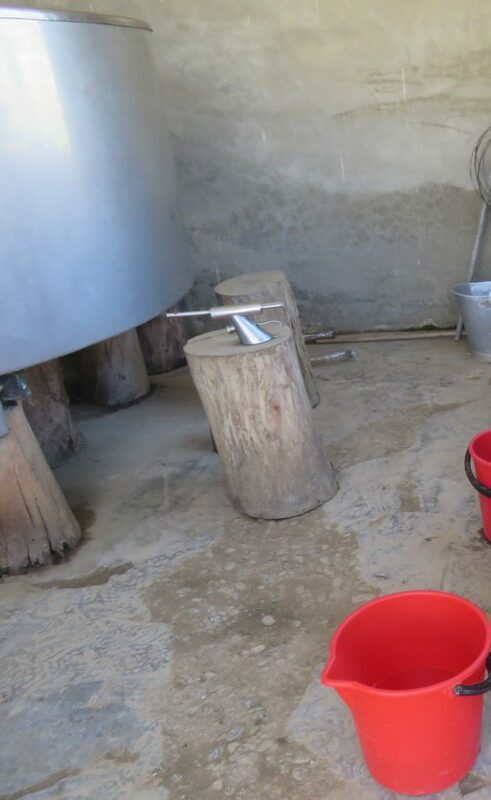 También había comida tradicional, como un queso añejo de leche de vaca del valle bajo de Comarapa. El sabor era maravilloso, pero el olor a vaca no era para principiantes. Lo que más me impresionó era que muchos de los productos eran nuevos e innovadores. Cosas que no se encuentran en el supermercado de Cochabamba, como manzanas secas, duraznos preservados con la pepa (húmedos y dulces sin azúcar agregado). Quinua y trigo en bolsas impresas con etiquetas ya estaban listos para hacer sopa. En un blog previo hemos dicho que los campesinos luchan para hacer etiquetas dignas de sus lindos productos. Por ley las etiquetas tienen que describir los ingredientes. Por ejemplo el chocolate estaba envuelto en un papel hermoso con una etiqueta impresa. Mi favorito era el vinagre de manzana, en botellas recicladas de cerveza mexicana. Los agricultores habían tapado la etiqueta original con una de papel, orgullosamente explicando que esta vendimia se hacía únicamente a partir de tres ingredientes: manzanas orgánicas, chancaca pura, y agua. Las botellas llevaban una tapa metálica de amarillo brillante. La mayoría de esas asociaciones rurales han recibido apoyo, a menudo de su parroquia o de ONGs vinculados a la Iglesia, algunos con voluntarios de Europa y otros lados. La ayuda de forasteros en la manufactura y el envase sí había contribuido a la calidad de los bienes, pero los agricultores estaban auto-motivados a vender sus productos. La agricultora en gran medida se trata de producir algo para vender. A pesar de que el evento se trataba del comercio justo, no había mención de hacerse certificar como comercio justo. Una expositora el primer día mencionó varios de los obstáculos que previenen que los campesinos puedan certificarse, y este grupo había estado plenamente de acuerdo con ella. 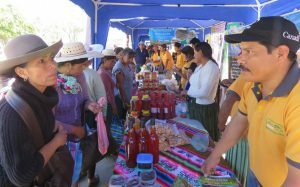 Estos campesinos organizados tenían bien claro que el comercio consiste en tener algo bonito para vender: atractivo, de alta calidad y bien presentada. Las familias campesinas en todo el mundo merecen un precio justo por sus productos, y el mercadeo inteligente les ayuda a lograrlo. This blog often features farmers creatively adapting ideas they learned from watching farmer learning videos. It should come as little surprise that agricultural extension people can also get inventive with new ways to show the videos. In April 2017, I gave several organizations in Bolivia copies of a DVD with seven videos, each one with Quechua, Spanish and Aymara versions. Two of the videos were made with farmers in Bolivia, but the other five presented farmers from other countries. María Omonte, an agronomist and the national director of the NGO World Neighbors, watched all seven of the videos. To my initial surprise, María also watched all of the videos in Spanish on the Access Agriculture video portal. She is a registered user and checks the portal frequently to see if any new Spanish versions of videos have been added. María graduated from the prestigious agricultural university in Honduras, El Zamorano, and her training and natural curiosity has made her a keen life-long learner. 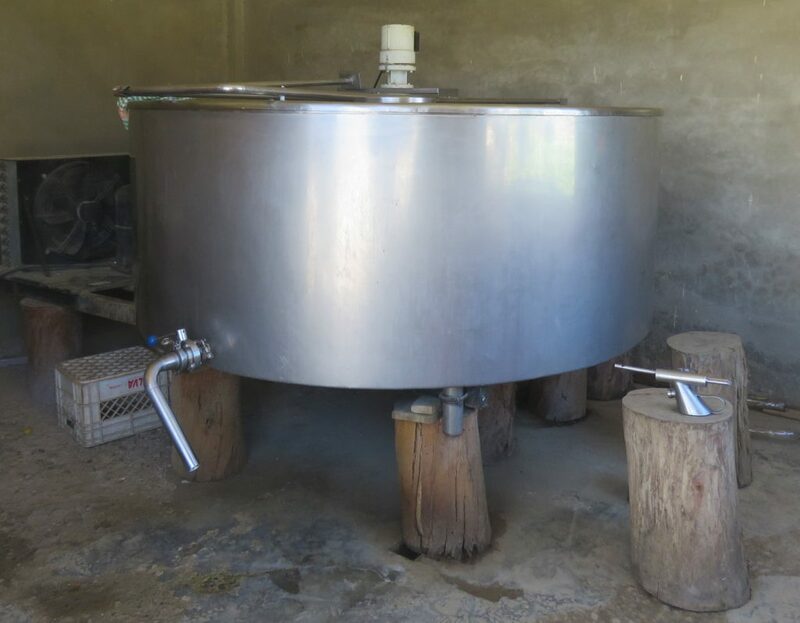 María and her team had been working for almost three years in six rural communities in Vila Vila, in the warm, semi-arid valleys of southern Cochabamba. Last December the team introduced the idea of organic fertilizer and Bordeaux mixture, a copper-based fungicide, as well as other similar products for diseases of papaya, lemon and other crops. 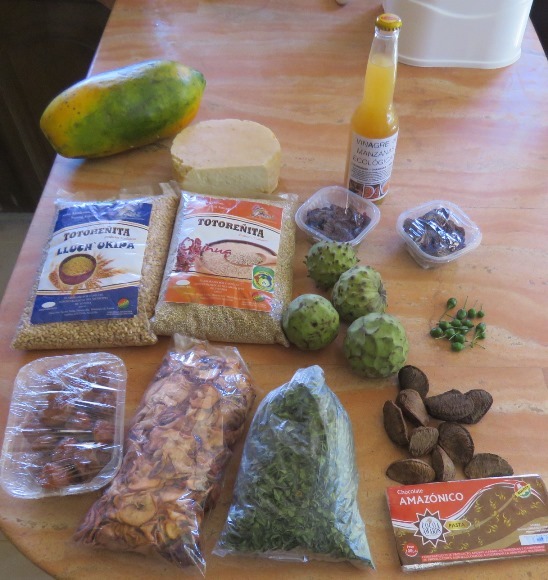 After seeing some practical demonstrations and receiving starter kits with the ingredients, some of the farmers tried the Bordeaux mix, but María felt that they needed more encouragement to keep using them. So María decided to creatively combine two videos. She took the Quechua version of “Let’s Talk Money” from the DVD, and downloaded the Spanish version of “Turning Honey into Money”, which was not on the DVD, from the Access Agriculture video portal. 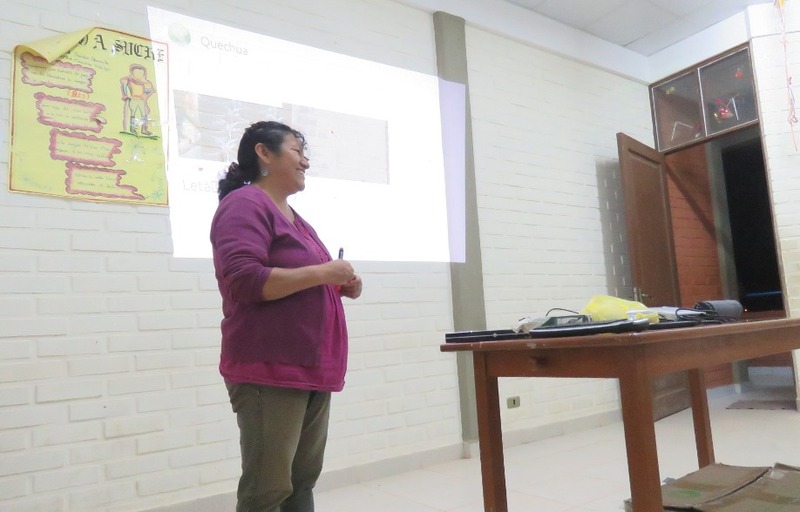 She decided to use these two videos along with other information to make a unique training event for the six Quechua-speaking villages, a five-hour drive from the city of Cochabamba. I was there last week in the community of Sik’imira at an evening meeting in the local school. The courtyard was full of high school students playing a furious game of football on the cement basketball court. María and her driver, Enrique Mancilla, set up their projector and within minutes 25 farmers, over half women, had filed in and taken their seats. María told the group that she had a video in Quechua, but from Mali, a country in Africa. From previous screenings María had learned that three details in the video were unfamiliar to farmers, so she explained those. The video mentions millet (“a small grain”) and cowpea (“a bean”) and third, the currency in the video is called the franc. By now the football game outside had ended, and the teenagers were playing loud, pounding music. So the video was a bit hard to hear. Still, people said they understood it, and they had no questions. María used this as an opportunity to say: “In the video we saw farmers and their facilitator adding up costs for different practices with millet and cowpea to see which one is more practical. Would you like to do the same with one of your crops?” The farmers suggested sweetpotato. It takes skill to walk through each step in the production of a crop and at the same time count the costs in front of an audience. Unfazed, María launched into the exercise in fluent Quechua. She started to struggle with the loud music still pounding next door, but eventually they turned it down enough for her to continue. At the end, people looked at the results. “We’re not making much money,” one said. “That’s sad,” another added. María used this as an entrée to discuss organic inputs, to improve yields, then she asked the packed room – standing room only – if they would like to watch another video. It was 10 PM, past everyone’s bed time, but to my surprise everyone agreed. Enrique and María put on the video Turning honey into money. She explained that this one was made in Kenya, also in Africa. By then, the music outside had mercifully stopped. The video played beautifully. Although it was in Spanish, which few in the audience understood, María told me that the images in this video are so clear that everyone understood it. As the video ends, one man shouts out “Now we have the sweet taste of honey in our mouths!” Everyone laughs. None of the Bolivian farmers comment on the skin color of the people in the videos, or their clothing. That is not an issue. María thinks that farmers are intrigued by seeing smallholders from far away. After watching the honey video, María says that she can bring an expert beekeeper to help them get started raising bees. The farmers request a meeting on Sunday morning. María and Enrique both agree to give up their weekend to do that, delighted at a small victory. Until now, the Sik’imira community has only ever wanted to meet at night. A Sunday morning meeting suggests that they are taking the extension program more seriously, helped by the warm response to the two videos. A creative development professional, with access to a library of videos, can mix and match, combining a video on calculating farm costs with one on honey. Then she can add more information, to make an exciting training event that local people find relevant. Let’s talk about money is available in 30 languages, including English, Spanish and Quechua. Turning honey into money is available in 10 languages, including Spanish and English. 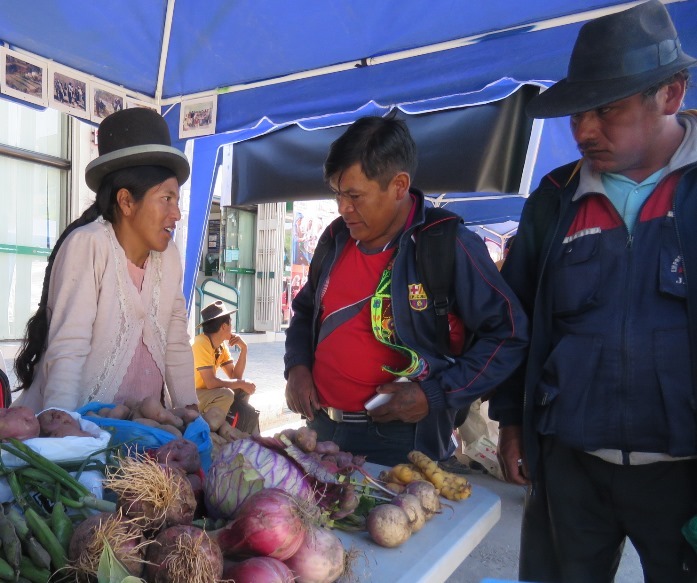 Our work in Bolivia is funded by the McKnight Foundation’s CCRP (Collaborative Crop Research Program). Este blog a menudo resalta a agricultores que creativamente adaptan ideas que hayan aprendido cuando ven videos de capacitación. No nos debe sorprender que los ingenieros extensionistas también inventen nuevas maneras de mostrar videos. En abril del 2017, en Bolivia, repartí copias de un DVD a varias organizaciones, con siete videos, cada uno en quechua, español y aymara. Dos de los videos se hicieron con campesinos en Bolivia, pero los otros cinco mostraron a agricultores de otros países. María Omonte, una agrónoma y la directora nacional de la ONG Vecinos Mundiales, miró los siete videos. Para mi sorpresa inicial, María también miró todos los videos en español del portal de videos de Access Agriculture. Ella se registró al portal y revisa frecuentemente para ver si hay nuevas versiones en español de los videos. María se egresó de la prestigiosa universidad agrícola El Zamorano, y su formación y curiosidad natural le han ayudado a seguir aprendiendo toda la vida. María y su equipo llevan casi tres años trabajando en seis comunidades en Vila Vila, en los valles cálidos y semi-áridos del sur de Cochabamba. En diciembre pasado el equipo introdujo la idea del fertilizante orgánico y el caldo bordelés, un fungicida en base a cobre, y otros caldos para enfermedades de papaya, limón y otros cultivos. Después de ver algunas demostraciones prácticas y recibir materiales de arranque, algunos comuneros probaron el caldo bordelés, pero María pensó que ella podría animarles más a usar los caldos. Así que María decidió hacer uso creativo de dos videos. Tomó la versión en quechua de “Hablemos del dinero” del DVD, y del portal de Access Agriculture y bajó la versión en español de “La miel es oro,” el cual no estaba en el DVD. Ella decidió usar esos dos videos juntos con otra información para crear un taller de capacitación para esas seis comunidades de habla quechua, a cinco horas en auto de la ciudad de Cochabamba. Yo estuve allá la semana pasada, en la comunidad de Sik’imira en un taller en el colegio local. El patio estaba lleno de estudiantes de secundaria que jugaban un partido enardecido de fulbito. María y su conductor, Enrique Mancilla, armaron su proyector y dentro de minutos unos 25 agricultores, casi la mitad mujeres, habían tomado sus asientos. María contó al grupo que tenía un video en quechua, pero de Mali, un país en Africa. En talleres en otras comunidades María vio que unos tres detalles en el video eran extraños a los agricultores, así que se les explicó: el video menciona mijo (“un pequeño grano”) y caupí (“un frijol”) y tercero, la moneda en el video se llama el franco. Ahora el partido de fulbito se había terminado, y los jóvenes habían encendido una música fuerte y pulsante. Así que nos costó un poco escuchar el video. Aun así, la gente dijo que lo entendieron, y no tenían preguntas. María usó esa oportunidad para decir “En el video vimos que los agricultores y su facilitador sumaban los costos de diferentes prácticas con el mijo y el caupí, para ver cuál era más rentable. ¿A ustedes les gustaría hacer lo mismo con uno de sus cultivos?” El público sugirió el camote. Requiere de destreza hablar paso por paso de la producción de un cultivo, contar los costos delante del público. Pero María arrancó el ejercicio de una vez en quechua fluido. Empezó a frustrarse con la música tan fuerte al lado, pero después de un tiempo le bajaron el volumen un poquito y siguió adelante. Al final, la gente miró los resultados. “No ganamos mucho dinero,” dijeron. “Es triste,” agregaron. María usó esa observación como una entrada para hablar de los insumos orgánicos, para mejorar su producción. Ahora había tanta gente que no había donde sentarse. María les preguntó si estaban cansados y si querían irse o si querían ver otro video. Eran las 10 PM, cuando todos normalmente están dormidos, pero querían ver otro video. Enrique y María encendieron el video La miel es oro. Ella explicó que este se hizo en Kenia, también en Africa. Ahora por fin la música de los chicos se había terminado. El video se escuchó una maravilla. Estaba en castellano, que no todos entienden, pero como María me dijo, las imágenes en este video son tan claras que toda la gente entendió. Al fin del video, un hombre gritó “¡Nos hemos quedado con el sabor de la miel en la boca!” todos se rieron. Ninguno de los comuneros comentó sobre la tez de la gente en los videos, ni de su ropa. Eso no les importaba. María cree que a los campesinos les intriga ver a sus colegas en países lejanos. Después de ver el video sobre la miel, María dijo que ella podría traer a un apicultor experto para enseñarles a criar abejas. La comunidad pidió una reunión el domingo en la mañana. María y Enrique se quedaron en eso, sacrificando su fin de semana, pero felices con esa pequeña victoria, Hasta ahora la comunidad de Sik’imira solo ha querido hacer talleres de noche. El querer hacer uno el domingo en la mañana sugiere que la gente empieza a tomar este programa de extensión un poco más en seria, ayudada en parte por su cálida reacción a los dos videos. Una creativa profesional del desarrollo, con acceso a una videoteca puede combinar diferentes títulos, usando un video sobre cómo contar costos de producción con uno sobre la miel. Luego puede agregar más información para hacer un taller ameno que es relevante para la gente local. Hablemos del dinero está disponible en 30 idiomas, incluso inglés, español y quechua. La miel es oro está disponible en 10 idiomas, incluso español e inglés. Nuestro trabajo en Bolivia es financiado por la CCRP (Collaborative Crop Research Program) de la Fundación McKnight. 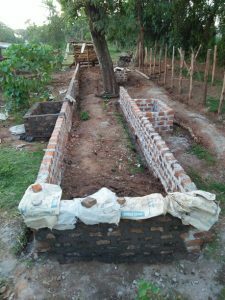 Last week I wrote about Isaac Enoch, who is using drip irrigation to grow vegetables in South Sudan. This week we meet Tom Juma, who is also one of the registered users of the Access Agriculture video platform. Tom Nyongesa Juma grew up in a small village in Bungoma, in Western Kenya, about an hour from the city of Kisumu. As a young man he earned a B.Sc. in forestry, and studied soil science for an M.Sc. 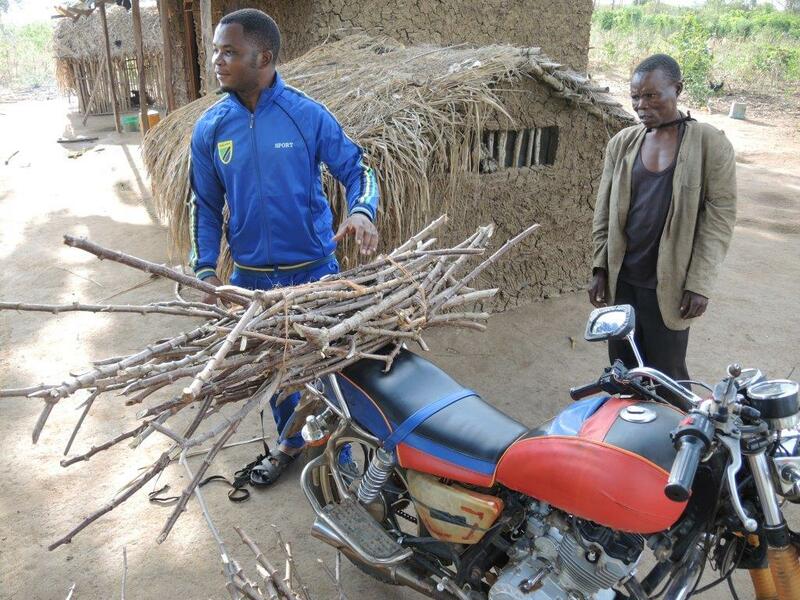 He nearly finished that degree, but was frustrated by a lack of money to pay his school fees. After university, in 2008, Tom started to work for various NGOs, especially ones that gave him an opportunity to help farmers improve their yields of cereals and other crops. Then in 2017, Tom decided to put his passion for agriculture into building his own model farm. He now has turkeys, chickens, sheep and three cows. Tom is building a barn to hold 30 milk cows. He is motivated by the desire to teach others, “the extension bit,” as he puts it. But Tom also sees the urgency of producing food for Kenya: “We have so many mouths to feed.” Tom wants his teaching farm to focus on young people. He is building the barn so it can accommodate learning visits by primary schools and others, to teach kids about agriculture. 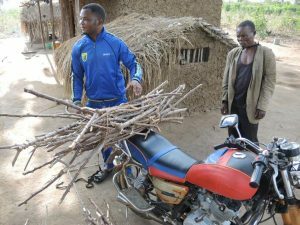 “I want to show that you can make a living by agriculture, and do it smartly”, Tom explains. As a forester and a soil scientist, Tom feels that he is not really an expert on livestock, so he has educated himself, mostly through videos. He surfed the web for any videos on livestock and horticulture and estimates that he watched over 300 videos. Tom speaks three languages, but he still found some videos in languages he didn’t understand. He watched them anyway, learning by observing the images. From videos, Tom has learned about artificial insemination and placing ear tags on cattle. Tom says that by this time next year, he will be educating young people, and will be using videos as a key element to do that, on his model farm. Tom says that the Access Agriculture videos are of good quality, “short and to the point.” He has watched Swahili versions of several Access Agriculture videos, including the one on yoghurt making and on making a rabbit house. “They were nicely translated and educational,” Tom says. Access Agriculture has 51 videos in the Kiswahili (or Swahili) language, here. The photos are courtesy of Tom Juma.